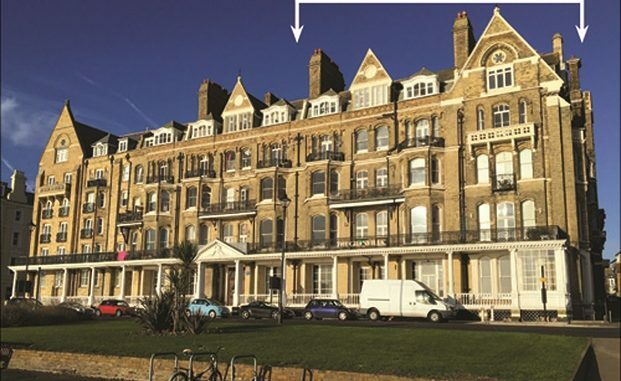 Part of the former Granville Hotel in Ramsgate sold at auction yesterday (February 5) for well above the guide price of £200,000. The Granville Bars, which has sea views and sits in the block designed by the famous architect Edward Welby Pugin, went under the hammer for £310,000. The Granville was a hotel between 1869 and 1946 before being sold by proprietors Spiers & Pond. It is now a private residence containing 48 self-contained flats. The lot was for a substantial part of the ground floor and basement. Auctioneers Clive Emson say there is the potential to turn it into residential units, as long as all necessary consents are obtainable. It was offered at the Clive Emson auction with the remainder of a 999 year lease from 2013.